Peach Ice Cream at Durbin Farms Market. Meg’s #14 or #87 on the countdown of 100 Dishes To Eat In Alabama Before You Die. ****It is really great ice cream said to be made from high quality cream. Chilton County Peaches are THE BEST! I found the market to be clean and interesting. Fun shopping for fresh market products, and visiting the cute shop with some killer cowboy boots. Loved the cafe where you can sample some fantastic foods! *This dish meets the criteria set forth by Alabama Tourism, and these folks are dedicated to local food with Alabama style. Operating since 1938 and the I-65 market since 1960. There are three sites in Clanton. Peach Pie at Peach Park and Pecan Pie at Heaton’s. Why not try all three together? I gave them all 5 MEGASTARS. I really LOVE these pies! 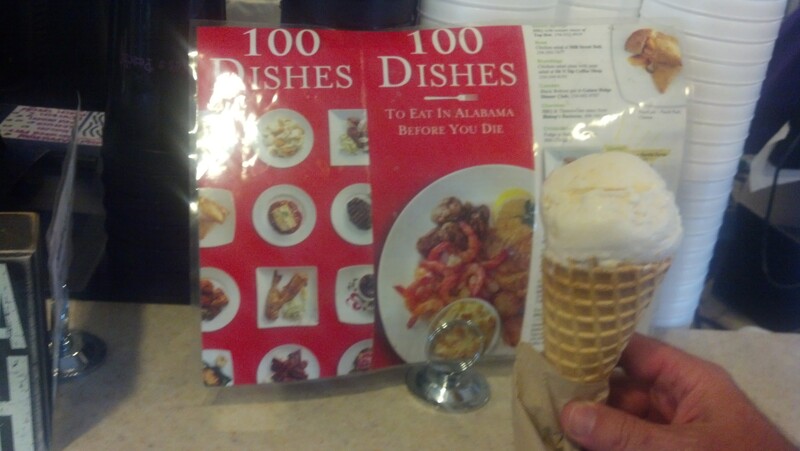 Megabites Alabama *100 Dishes to eat in Alabama Before You Die is a compilation of food to chow down on Bama style. Thanks to Tourism Alabama, www.alabama.travel My Alabama bucket list just became a little easier. I am going to have some fun while making my way like Ms. Pacman, in yet another state that I call home. Download the alphabetical brochure that begins in Abbertville and ends in York. From the little old diner to the white cloth joint, it is an opportunity to explore and experience pride in the food from restaurateurs who are dedicated to local food with some Alabama style.